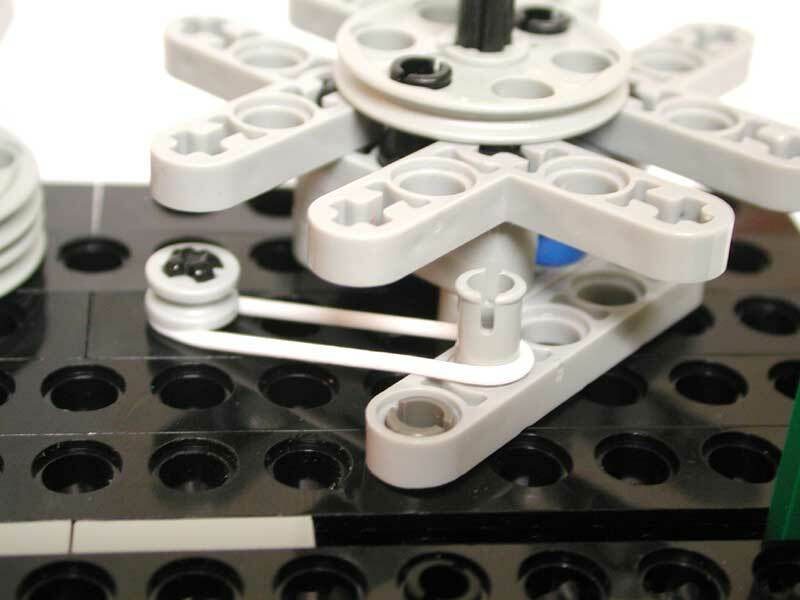 By reading the HispaLUG forum, I found a description and animation for a 'Geneva Mechanism' implementation with LEGO TECHNIC. The Geneva drive or Maltese cross is a mechanism that translates a continuous rotation into an intermittent rotary motion. It is an intermittent gear where the drive wheel has a pin that reaches into a slot of the driven wheel and thereby advances it by one step. The drive wheel also has a raised circular blocking disc that locks the driven wheel in position between steps. must have simplified the CAD animation process by reducing number of frames to 1/4. Below also a draft for a similar and compact design from a different author. At its right another Geneva Mechanism implementation from Philo. Mechanisms like this, have their application inside machines like mechanic watches and celluloid movie projectors just to give a few examples. See below a schematic for the application inside a movie projector. Among LEGO and AFOLs, a mechanism like this, maybe of great use for GBC for instance (something to talk about, into a later TBs post...). 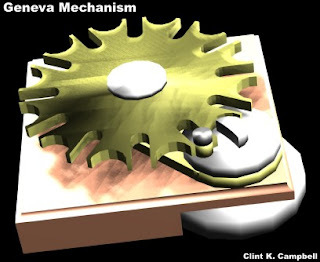 Below some animations, that also help to better understand how the mechanism works (standard version on the left and 'Internal Geneva Drive' on the right). Another example where the concept gets furthers extended, with higher number of steps per mechanism output revolution. Have a PDF to illustrate, but don't remember the link from where I took it.